Now that I’ve converted Jason into an eggplant eater, I’ve been playing around with eggplant recipes. This one is a variation on a dish my Mom used to make in Moscow when I was little. With all the garlic and herbs, it feels more like a Georgian or Armenian dish. I am not sure of its origins, but maybe my Mom will chime in with a comment about where she got this recipe. I haven’t had this dish since we left Russia 15 years ago, and although I improvised a bit, it brought back some great childhood memories. In Russia, we used very aromatic sunflower seed oil for cooking. You can find it at Whole Foods, or you can go to a Russian store and buy a bottle that’s cheap and excellent. But feel free to substitute it with olive or canola oil (olive oil is a better substitute in the stuffing and canola is a better substitute for frying the eggplant). Note: this dish is better made the day before to let the flavors mingle, so plan accordingly. Set a large heavy skillet over medium-low heat. Add 2 Tbsp of oil, onions, and a generous pinch of salt. Cook stirring occasionally until onions are tender and start to brown, about 15 minutes. Add 2 more Tbsp of oil, carrots, and salt to taste. Turn up the heat to medium. Cook stirring occasionally until carrots are tender and start to brown, about 15 minutes. Turn down the heat to medium-low, and continue to cook until the mixture is sweet and very flavorful, 5-10 minutes. Stir in garlic and parsley or cilantro. Taste and correct seasoning. 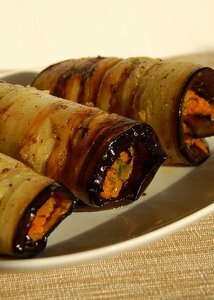 While stuffing is cooking, sprinkle eggplant generously with salt on both sides and lay out on paper towels for 15 minutes. It will release a lot of liquid resulting in better consistency after frying. Dry both sides of the eggplant well with paper towels right before frying. Set a large heavy skillet over high heat. When the skillet is hot, add enough oil to make 1/8 inch layer. Make sure your eggplant is dry. Place as many eggplant slices as will fit into the skillet in one layer. Fry until golden brown, 2-4 minutes. Flip and fry on the other side adding more oil as necessary to help the eggplant brown. Repeat with remaining eggplant adding more oil between batches and after the flip. Be generous with the oil, or the eggplant won’t caramelize properly. 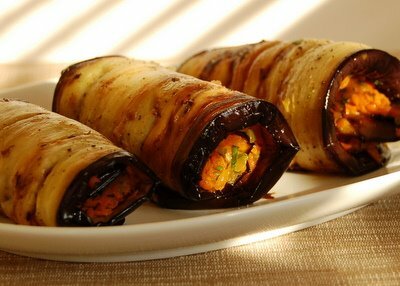 As eggplant slices are done, remove them to a plate lined with paper towel to absorb the oil. You can stack the slices up as long as you layer paper towels between them. Cool the eggplant and stuffing until you can handle them comfortably. Sprinkle the eggplant slices with a pinch of salt and pepper (go easy here since the eggplant is somewhat salted already). Why are you adding more salt? Because most of the salt you sprinkled on the eggplant before frying leaked out with the liquid the eggplant released. Spoon about 2 Tbsp of stuffing onto an eggplant slice. Spread the stuffing out to cover the whole slice, and roll it up from the thin end to the thick end. Repeat with remaining slices. Cover and refrigerate overnight. Bring to room temperature before serving or if you are as impatient as I am, you’ll eat it cold and still love it. The eggplant will keep for up to 4 days. Just WOW. This looks amazing. this dish looks great! I can't wait to try it out. I wonder why sunflower oil hasn't "caught on" in the states- it's great for high-heat cooking, and seems like a healthier, natural substitution for canola oil. And you're right about the great aroma- I love the way chicken kotlety smell when they're frying in the sunflower oil! I've read this post and was so touched that you are trying to recreate that dish. To tellyou the truth even I don't remember where it came from. My guess is - after eating so many yammy ukranian eggplant dishes while vacationing on the Asov sea shore I've tried to improvize my owen version of stuffed eggplant. But I have to admit I like your version much better. For once it's much healthier than mine and it sounds sooo yammy I have to try it some time soon. Since we can't seem to determine the origine of the dish, we'll just call it Malyutin eggplant :) I wouldn't say it's healthier than what we made in Russia. It took me at least 1/2 cup oil to fry 1 large eggplant. But it was SO good! In the words of my wife, "Ah, just heavenly!" 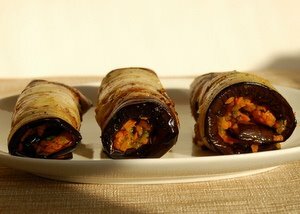 I just wanted to let you know, that with an abundance of eggplant and carrot at the same time, this recipe was an absolute saviour! Thank you so much for sharing. They were very very good and moorish! Excellent warm and cold! Just letting you know that I'm featuring this recipe as one of my South Beach Recipes of the Week where I spotlight low-glycemic recipes from other food blogs. It includes your photo (with a photo credit for you, of course) and link back to the recipe. Loved the sound of this. Helen, I ventured out to purchase an eggplant and had no idea of what I was going to do with it. I thank you for posting this dish. I put a Jamaican twist to this delicious recipe and found it to be one of the most deliciously creative things to do with eggplant. Thanks a bunch for this! I loved everything minus the oily outcome I encountered. It was still tasty though. Do tell about your Jamaican twist. It sounds really cool and I'd love to hear what you did. Thanks so much for this recipe!! I ate this once at MyMy's in Moscow (I am living here in Moscow) and it was okay, although not my favorite. I was looking for recipe's so I could eat more veggies and thought I'd try this. LOVE IT! I ate some warm tonight and it was great. I'll see if I like it cold tomorrow. Thanks again. A friend of mine makes a very similar dish. She is from the Ukraine. She says it is French dish originally but was adapted by Russians. She serves it with a dollop of sour cream, and it's just delicious. I can't wait to try your recipe. PS--I really don't like eggplant. Except for this. I hear you about the effort involved. I love them, but I don't make them too often because it takes a lot of time and dirty dishes. When I was growing up, I remember the whole family helping when my Mom would make this dish. It was a half a day project and we'd make an insane amount and eat it as an appetizer for the whole week. But I am glad that yours came out yummy, especially that you put so much work into them.